I've got loads of old mods (not by me) sitting around which I'm happy to upload if there are dead links, just ask and I'll see if I have it. So I have a little free time, not sure how long it will last, but I have enough to do a little recreational modding, but not enough to learn something new, so GP4 it is! 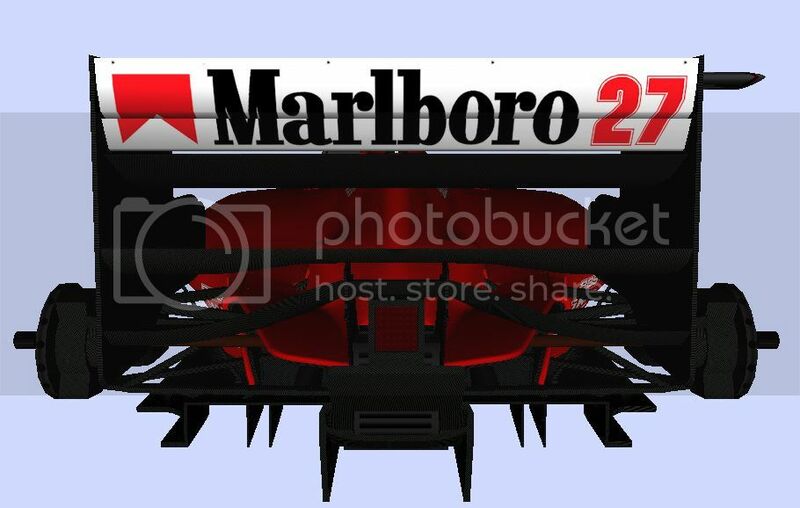 1994 is the season I fell in love with F1, and with so many changes throughout the season, the 2nd half of the year almost deserves it's own mod. 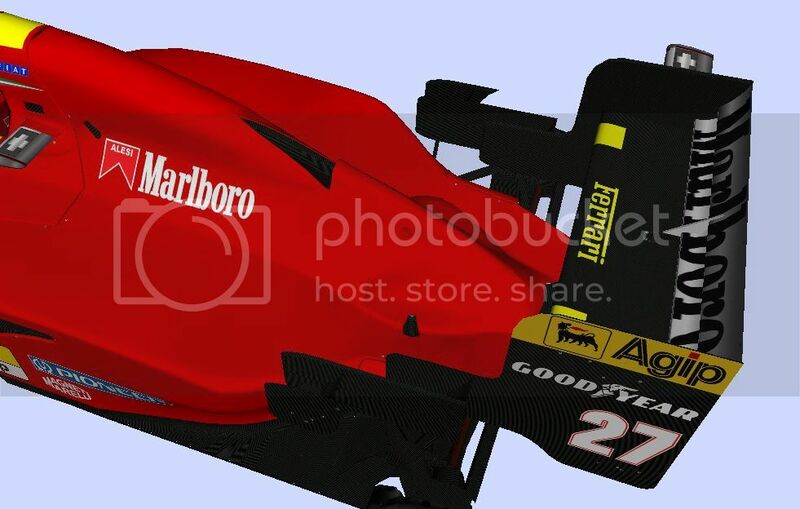 Changes include simpler front wings, raised floor and plank, simpler diffusers and holes cut in the engine cover. 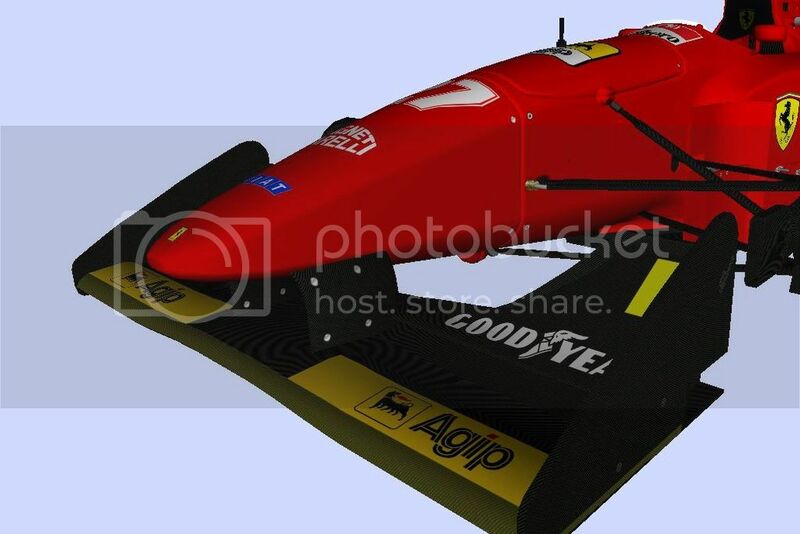 So here's a taster of the Ferrari 412T1B (Aus GP spec), my first car in 6 years. It's mapped too . Edited 1 time(s). Last edit at 09/19/2018 03:33PM by quickslick. Looks awesome. Very exciting that Fongu is back. Working on one thing at a time, so I may come back to the Jordan. I'm not a painter, so it's slow progress. Unfortunately my working psd file was lost yesterday, but I do have a tga saved, so I'll finish off painting on top of that. Edited 1 time(s). Last edit at 09/28/2018 01:19AM by fongu. The front wing end plates became much more basic, due to the ban on bodywork around the front wheels, but they did grow taller than before. The Ferrari started the season with a curved trailing edge and the front wing tapered forwards on each side, but for the 412T1B, they went for a much simpler arrangement. 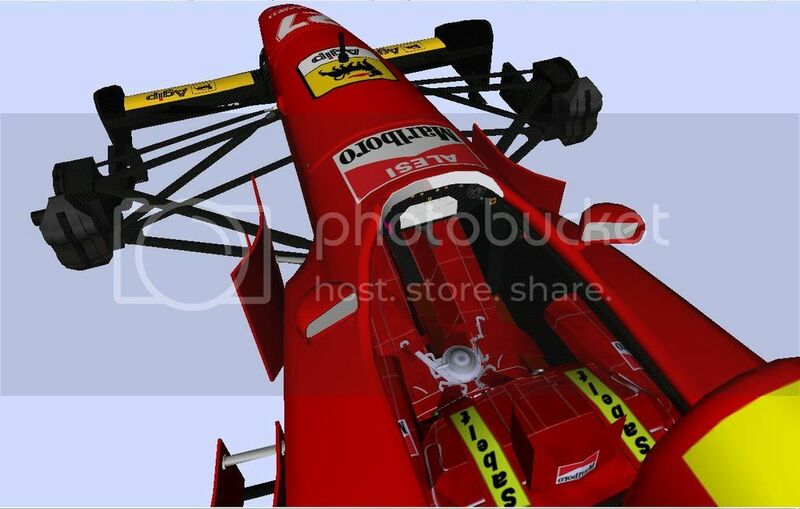 The Ferrari had a few bumps on the monocoque to house the suspension, and they seem to enjoy putting body lines through them - not very easy to model! 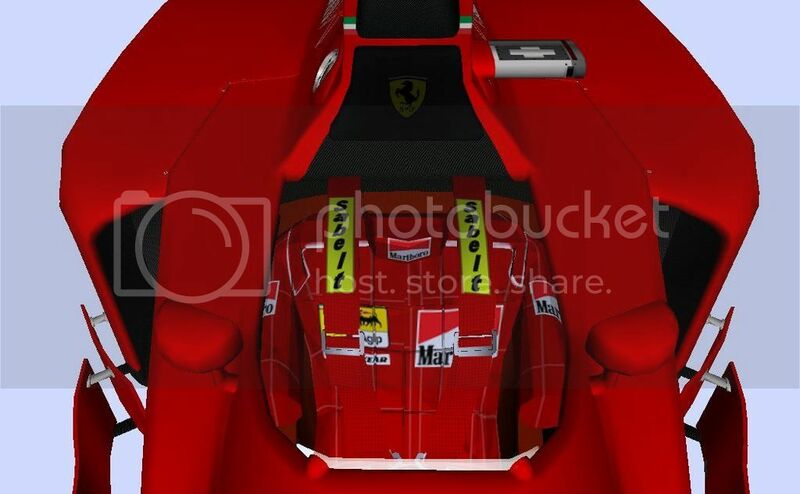 Ferrari went for a more conventional sidepod for the 412T1B, but you'll notice a bulge around the side of the cockpit, remnants of the previous rounded sidepod with the teardrop inlet. This is basically to house the driver in the cockpit. I can only guess that they had issues with the boundary layer detaching around this bulge, so they introduced barge-boards, initially 2 and then 4 from Portugal to the end of the season, as well as to manage the flow to the new sidepods and the wake from the front tyres. I've put a bit more effort into the cockpit and dashboard than previously, and thanks to lots of pictures from recent demos, I'm quite happy with the outcome. I started working on a slightly more complicated driver body on my 93 Tyrrell and 96 Footwork, to go along with 3D belts. However this will be the first released model with it. The rear of the sidepods are quite different from the early season 412T1, with the lower part making the most of the coke-bottle shape to feed the diffuser, whilst there was an increased surface area along the top, presumably to create more downforce from the shape of the sidepods. Housing the rear suspension was interesting, they had a bulge there from the early season car, but because of the increased surface area of the sidepod, they had to cut a hole in it where you can see the suspension through it. With all that work on the sidepod, they managed to make the back of the engine cover quite low, allowing them to curve the ends of the lower rear wing downwards (similar concept to the Newey's Williams). With the simpler diffuser design, the curvier sidepods and the lower rear wing all work together to recover some of the lost read downforce from the mid-season rule changes. 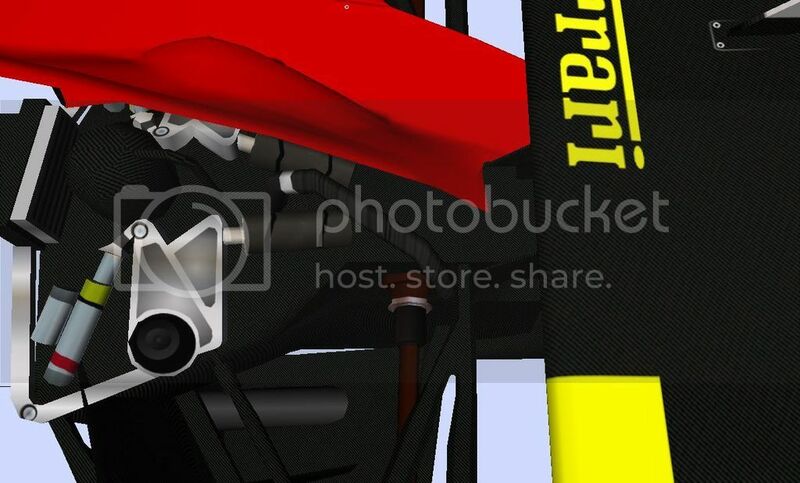 I haven't bothered with a complicated damage model, I wasn't too happy with the flickering of the airbox in-game. But I couldn't resist putting some detail in on top of the gearbox, and you can see what is underneath some of those bulges on rear of the engine cover. One of the carry-overs from the 412T1 was that they put a housing around the sides of the gearbox to hide the suspension mounting points, which made my job a bit easier. Edited 1 time(s). Last edit at 09/28/2018 01:17AM by fongu. Great eye for detail, incredible! Hello Fongu, Good to see that you have not given up GP4 modeling altogether and are working on new stuff. Maybe you can help me with the following question. I don't know whether you have been involved in the 1988 mod. It's my favorite, except for the cockpits. So I am wondering how hard it would be to combine the 1988 mod with the cockpits from the 1991 mod. I only made one car for 1988 a very long time ago. 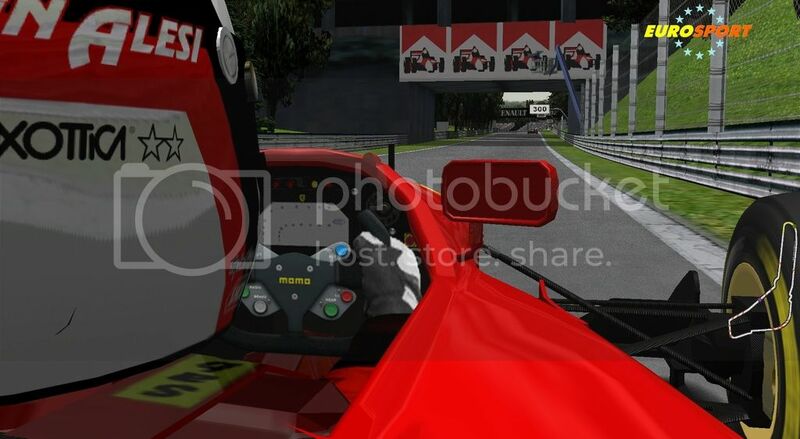 You can use the cockpit shape from the 1991 mod, but you will have to create new textures for each team. I don't know which cockpit shapes are used at the moment. Update from me, sorry the Ferrari progress has stalled, mainly because I lost my texture file, I only have the flat tga file left. If someone wants to take over the painting of it, they are welcome to help, I only need to map Bergers car and tidy a few things here and there and it's ready. In the meantime, I have started the McLaren from 1994, but progress is slow since I moved house across the country. Also I do all my work in zmodeler 1, so probably not the quickest tool! Still, I got to see the MP4/9 in the flesh at Donington Park and got a lot of great photos, but could not access the rear of the car. The shape is around 80% complete, and it's the most detailed car I've ever created (screenshots soon), even more detailed than the Ferrari 412 T1, but still low-poly enough to be playable. I can barely wait guys.